There are plenty of guesthouses and hotels where you can meet other travelers. The Japanese are keen to speak with foreign travelers, but it helps to speak slowly and clearly. Learning a little Japanese makes everything easier. Lessons and tours are a great way to meet locals and travelers. There are plenty of solo-diner-friendly restaurants in Kyoto. 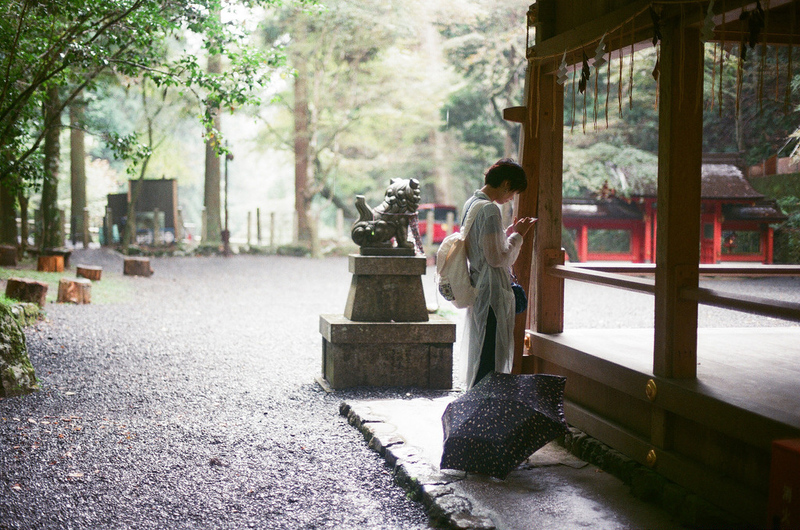 If you want to be alone, Kyoto has some great quiet places. Note: This page contains general solo travel information. If you’re looking for information about solo female travel in Kyoto, see our Solo Female Travel in Kyoto (and the Rest of Japan) page. If you can’t find a travel partner to visit Kyoto with, don’t put off coming. You can have a great time in Kyoto by yourself. 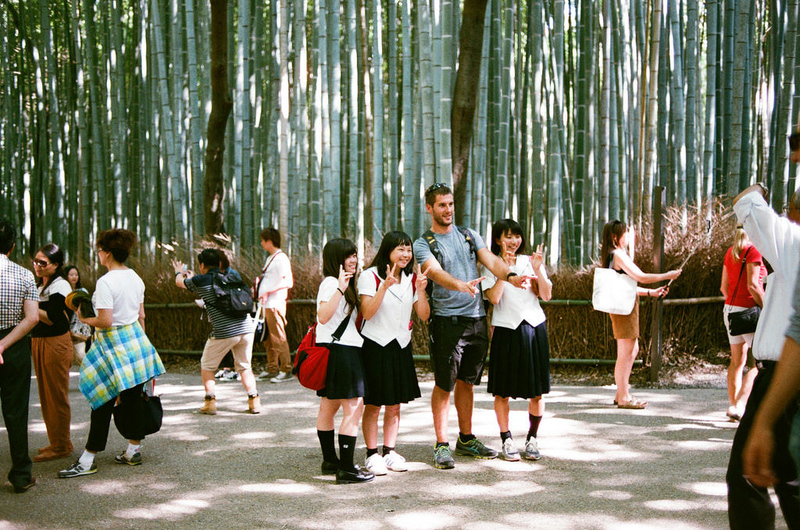 If you’re looking to meet people, both Japanese and other travelers, it’s easy to do. And if you’re looking for some quality alone time, then you’ve come to the right place: Kyoto is filled with quiet places like Zen temples and peaceful gardens where you can stop the clock and really think (or, not think, as you wish). On this page, you’ll find everything you need to know to have a brilliant solo trip to Kyoto. With a brilliant location right on the doorstep of Gion, this friendly hostel comes complete with a great downstairs bar where you can meet other travelers and sample some great sake. Right in the middle of downtown Kyoto, this sociable and casual guesthouse is named after the world’s most famous backpacker ghetto: Khaosan Road in Bangkok. Like it’s namesake, it’s a fantastic place to meet other travelers. The largest and most social of Kyoto’s guesthouses, this large guesthouse has a mix of private and dorm rooms. Facilities include a rooftop terrace, a bar, a restaurant and a lounge. It’s super easy to meet other travelers here. If you prefer a hotel over a guesthouse, you’ll find that the Palace Side Hotel is the most sociable and traveler-friendly hotel in town. The rates are very reasonable, there’s a nice lounge/restaurant and it’s got all the things a traveler needs, including washing machines. And you can’t beat the location: It’s right beside the Kyoto Gyoen (Imperial Palace Park) and above a subway station. If you’d prefer to meet Kyoto locals at your accommodations, you might consider Couchsurfing or AirBnB. 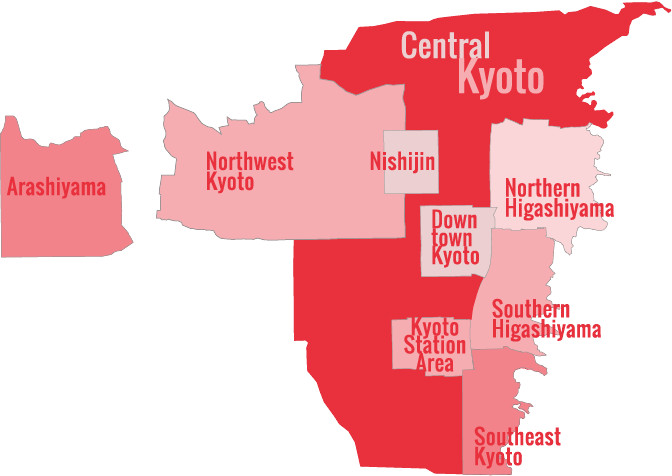 At present, Couchsurfing.com does not have a Kyoto section, but it’s likely to be added very shortly. Try searching and see what you come up with. AirBnB is exploding in Kyoto and new places are opening everyday. However, a LOT of them are places where you’ll never meet the hosts (the keys will be left in the mailbox etc). So, if you want to meet your hosts, search carefully and read the comments. Women speak better English than men: Yes, it’s a huge generalization, but it tends to be true, since Japanese women are more likely to major in foreign languages and men are more likely to choose economics. They also tend to be less shy. Speak slowly, clearly and smile: Remember, English is difficult for most Japanese. So, choose simple words, standard English (ie, non-idiomatic expressions), and speak very clearly and slowly. Write things down: Most Japanese can read English better than they speak it, so if you can write something down, they can usually figure out what you want (and it gives them time to relax and calm down). Use a translation app: Google Translate and other apps make communication a breeze. Learn a little Japanese: It helps to learn a little Japanese. It puts people at ease, opens doors and gets a conversation started. If you want to know some easy and useful Japanese, check out our Most Useful Japanese Expressions page. There are all sorts of tours available in Kyoto. My own company, Chris Rowthorn Tours, offers five different tours of Kyoto that range from 2 to 6 hours. The guides are all professional bilingual Kyoto locals. For more information, visit the Kyoto Walking Tours page. Of course, there are lots of other tours available in Kyoto and a little searching will turn up tours in all price categories, including free tours. If you’re not shy, you can meet locals in bars and restaurants, where a bit of alcohol usually makes things easier. A particularly sociable form of restaurant is the izakaya, which is a cross between a pub and a restaurant. 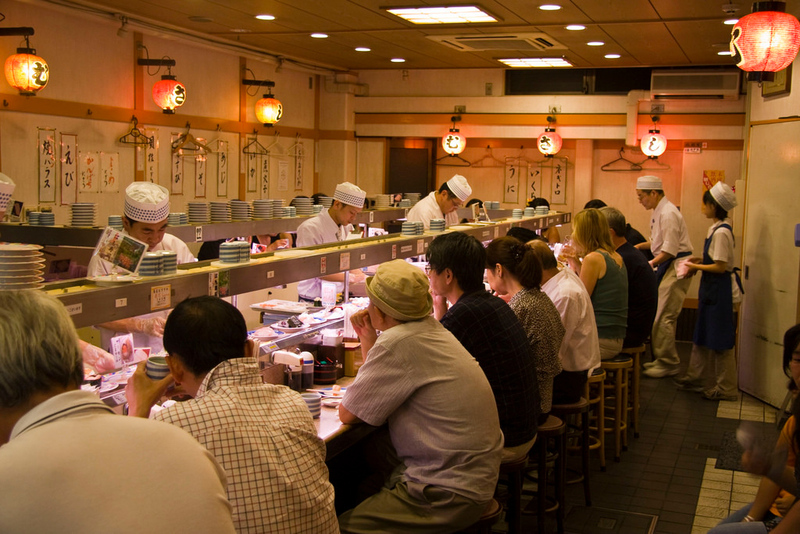 If you sit at the counter at an izakaya, it’s likely that the person next to you will strike up a conversation, especially after they’ve had a bit of sake or beer. If you join a guided bicycle tour, you’ll be together with a group of other travelers for most of the day. It’s probably the single best way to meet other travelers and have a great time while you’re at it. Kyoto Cycling Tour Project offers the best cycling tours of Kyoto in English (and other languages). The Kyoto International Community House (KICH) offers various lessons for visitors and foreign residents of Kyoto. Offerings include Japanese language, ikebana, calligraphy (shodo) and tea ceremony. Visit the KICH page for more details. There are several bars in Kyoto where foreign travelers and foreign residents of Kyoto gather. These include the Pig & Whistle (near Sanjo-Keihan), Hub (downtown) and Ing (downtown). All of them can be found on Google. Ippudo serves some of the best ramen in Kyoto and there’s a long counter where solo diners can enjoy it. It’s right downtown. The always-popular Ganko Sushi in downtown Kyoto has a long counter where you can enjoy sushi or just about any other Japanese dish. Hint: the a la carte sushi is better than the sets (but, of course, costs more). It might seem intimidating to enter, but this downtown Kyoto sushi specialist is actually pretty welcoming of solo diners. If there’s room at the counter, they’ll put you there, otherwise, they’ll seat you at one of the tables. The sushi sets are good quality and good value. This popular downtown okonomiyaki specialist has enough space so that solo diners can get their own table (as long as you go outside of peak hours). This is our favorite café in Kyoto. In addition to the usual coffee drinks, you can get pastries and light meals. This mostly-vegetarian restaurant has a cramped counter where you can enjoy some seriously healthy and honest Japanese food. The upstairs at this falafel specialist in Northern Higashiyama has plenty of space for solo diners to get their own table. This fine Northern Higashiyama restaurant has a counter where you can enjoy their delicious noodles and a la carte fare on your own. This tasty downtown Indian restaurant has lots of small tables that are comfortable for solo diners. If you go slightly off-peak, you can usually get a table without waiting. The huge park that surrounds the Kyoto Imperial Palace, known as the Kyoto Gyoen, is Kyoto’s Central Park. It’s filled with secret grottos, quiet pathways and secluded clearings. Find a bench and make it yours for the afternoon. The Kyoto Botanical Gardens are huge and contain all kinds of secret areas. Once you get away from the greenhouse and the other popular areas, it can feel almost deserted. It’s the perfect place for a peaceful stroll. There are over 1000 temples in Kyoto. Only about a dozen of these attract a lot of visitors; the rest are often completely deserted, even during busy seasons. So, find a quiet local temple and make it yours. Our Off-the-Beaten-Track Itineraries make it easy to find a secluded temple. Kyoto is surrounded by mountains on three sides. As soon as you step into the hills, you leave the hustle and bustle of the city behind. Choose one of the five routes we list on our Best Kyoto Hikes page and enjoy a few hours of peace in the forest. The Kamo-gawa River, which bisects Kyoto, has great walking paths on each bank. 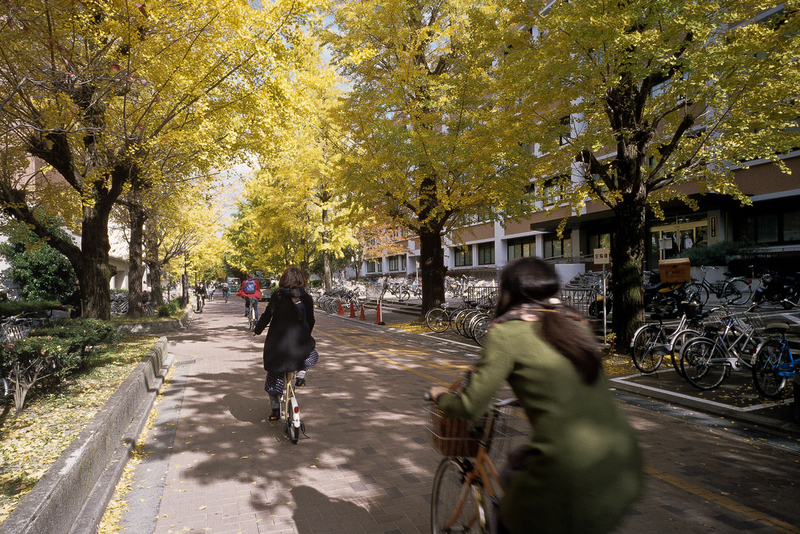 Once you get away from downtown, you’ll find the riverside areas pleasantly uncrowded and peaceful, especially north of Imadegawa-dori Street (ie, north of Demachiyanagi). 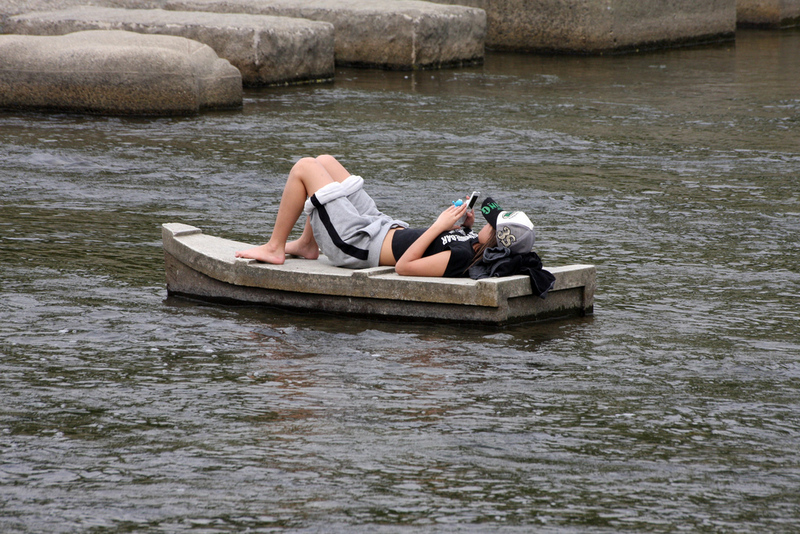 It’s a great place to put a blanket down and do some reading, sunbathing or napping.